Matakana's much-awaited Vivian Gallery in Omaha Valley Rd is to open at 4pm on Saturday Dec 1 with a show of prominent local artists. In May I interviewed Vivian Gallery manager Oliver King - see: A new gallery for Matakana. 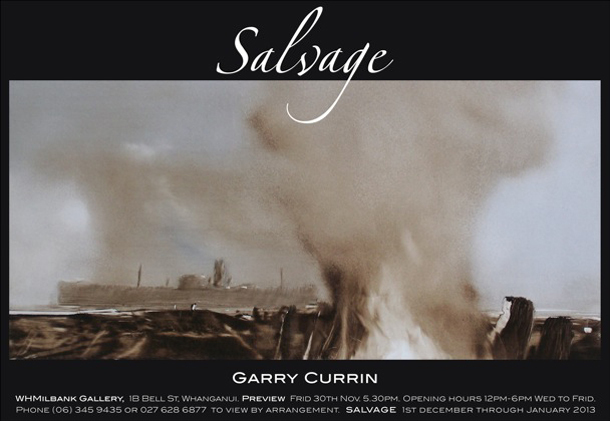 Prominent Baddeley's Beach artist Garry Currin is exhibiting in Wanganui in December. From The Big Idea: Artist Garry Currin's first exhibition in his old hometown of Wanganui is a sea narrative, a storyboard idea about the foundering of the cargo ship 'Port Bowen' which ran aground at Castlecliff Beach on Wanganui's west coast on July 18,1939. The stranded ship remained there for 3 years in which time it was slowly dismantled, much of the material being used for the war effort. 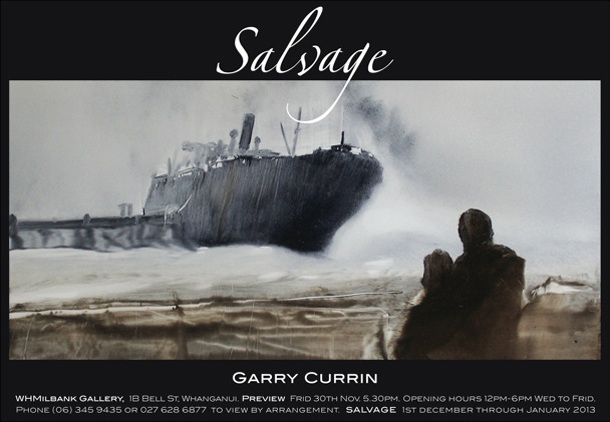 The series, titled Salvage, is a collection of creative responses to aural history; stories told to Currin as a child by both his mother and his grandmother and is a departure from his moody and enigmatic landscapes as he brings more figurative and representational elements into these works. Currin says, "I have worked to capture the sound of those stories. The sirens and the waves, the cold, the fires, the giant on the beach, the watching and the waiting". The renowned Tawharanui painter and sculptor Barry Lett is exhibiting at Remuera Gallery, opening at 3pm, Saturday November 10 and running for two weeks. 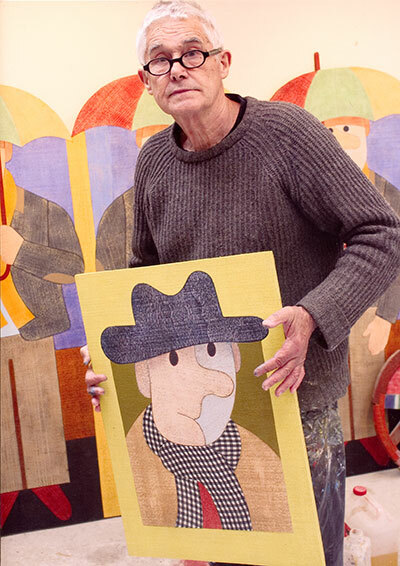 Having worked in sculpture for many years, over the last two years he has been working on paintings on rough-surfaced jigsaw-cut plywood. The works range from small to 3.5m wide. From Remuera Gallery: Over recent years, Barry Lett has built up a reputation as a sculptor for his large dog sculptures in wood or stone. Best known of these is probably ‘Big Rock Dog’, a large work covered in a skin of scoria stone which was awarded first prize in the inaugural Stoneleigh Sculpture Award Exhibition at the Auckland Botanic Gardens in 2008. He also worked in bronze and is mainly known for his extensive series of quirky bronze dogs. In 2009 Barry Lett stopped making sculpture and returned to painting. This exhibition of recent paintings is his first solo show in over five years. In an interview Barry Lett commented... 'To get back into painting I experimented with working on a building plywood called shadow clad which has a one way texture designed to look like rough sawn timber. It is used a lot on rural buildings. After much trial and error exploring the possibilities of this material, I developed a technique to make complex cut out and re–assembled jigsaw–like paintings. I arranged the one way texture in multiple directions and developed painting methods that made good use of the rough sawn nature of the surface.' All the works in this exhibition are made this way. The content of these works ranges from a single image to quite complex compositions that include people, animals, plants and various objects. In all the works, smaller or larger, I use the same process of construction which is not unlike that of a stone mason. Each part of a work is established separately i.e. drawn on the plywood, cut out and painted. This ‘finished’ part is then laid on fresh ply and drawn around to establish the next interlocking shape which is then cut out, painted and glued to the first shape. By this method a painting can grow, or ‘inflate’ in any direction to any scale. Colour decisions also evolve to resonate against each other. To start with I tried to ‘build’ a painting to fit a pr-established plan but found that the painting seemed to develop a ‘life of its own’ and not stick to the blueprint. I found it best to allow this to happen and the unexpected combinations of shape and colour made for a more exciting journey. As long as these ‘pop ups’ contributed to the poetic narrative and worked as integral parts of the pictorial space they were made welcome.